“We are excited to announce new custom parking trams to increase our fair guests’ experience. Along with the activities, shows and concerts that are free with entry to The Youth Fair, we will provide an updated tram service that will run like a Swiss clock to quickly and safely transport our guests to the Fairgrounds,” said Robert Hohenstein, president and CEO. The tram service will operate continuously and uninterrupted from the moment the parking lots open until the last guests need transportation to their vehicles in the evening. The fee for parking is $10. Parking tickets will be sold for half price when purchased online before March 14. Guests can buy up to three discounted parking tickets at a time through The Youth Fair website at www.fairexpo.com. The 2018 Youth Fair dates are March 15-April 8, except for Monday-Tuesday, March 19-20 and April 2-3, when gates are closed. Tram stop locations throughout Tamiami Park will be designated with signs and enhanced lighting. In addition, portable restrooms will be set up at each tram stop for the convenience of guests. For the first time, striping of the parking areas within Tamiami Park will allow for faster, easier and more efficient guest parking. other Youth Fair activities,” Hohenstein said. The Miami-Dade County Youth Fair & Exposition (The Youth Fair) is the largest charity event in South Florida. The not-for-profit association is dedicated to promoting education and agriculture while showcasing and rewarding youth achievement and providing quality family entertainment, all without taxpayer dollars. The annual Youth Fair exhibits more than 63,000 student projects to nearly 600,000 Youth Fair guests and, in 2017, awarded more than $530,000 in college scholarships, cash premiums and awards to students. To date, The Youth Fair has presented well over $11 million to the Miami-Dade community. The Youth Fair has been named a finalist for Community Outreach in the 2018 Greater Miami Chamber of Commerce’s Top Entrepreneurial Awards. It received the 2016 Trustee of the Year award from the South Hispanic Chamber of Commerce and was a finalist for the Coral Gables Chamber of Commerce 2016 Diamond Award for Large Non-Profit. It was recognized in 2015 as the Leisure & Entertainment Services Firm of the Year by the Latin Builder’s Association, the Non-Profit Organization of the Year by the South Florida Hispanic Chamber of Commerce, and was the Diamond Award Winner for Outstanding Hospitality Entity by the Coral Gables Chamber of Commerce. The Fair Exposition Center, which is the second largest convention center in Miami-Dade County, hosts an additional 70 community events each year. Visit www.fairexpo.com or call 305-223-7060. When Dorothy Baker joined the Miami-Dade Chamber of Commerce in 1984, she planned a quick stop — perhaps a year — to help South Florida’s oldest black chamber stabilize after floundering for months without a director. She stayed for 20 years, stepping down as president and chief executive officer in 2004. 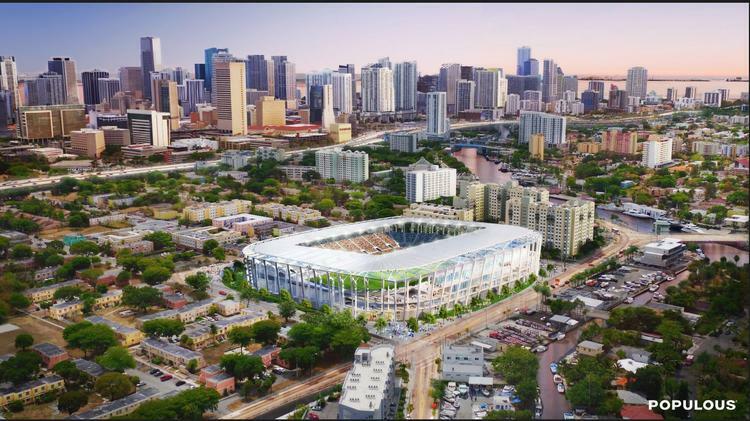 A rendering of the 25,000-square-foot MLS stadium proposed in Miami by Beckham United. Business partners of soccer icon David Beckham discussed his plan to build a 25,000-seat Major League Soccer stadium in Miami’s Overtown at a public meeting with local residents Wednesday evening, including the promised job impacts. Tim Leiweke, CEO of Oak View Group, said that after a delay of about a year and a half, Beckham’s group has raised all the money for the stadium project, which he said would exceed half a billion dollars. He promised that the venture would be completely funded by private dollars, not taxpayer funds, and it would pay its full share of taxes. There would also be certain community benefits and job training programs that would be put into writing, Leiweke said. Many South Floridians recall Sumner Redstone as the feisty billionaire entertainment mogul who snapped up Fort Lauderdale’s Blockbuster Entertainment and folded it into his Viacom media/entertainment empire. But lately, the 93-year-old Redstone has been portrayed as anything but strong and outspoken. He has lost some of the mobility in his jaw, does not walk easily, and has around-the-clock staff to help him move. Yet Redstone publicly had said that he would never retire nor make succession plans for Viacom, in which he owns a controlling stake. Meanwhile, his competency has been called into question in lawsuits that claim he lacked the mental capacity for certain recent business decisions. Once-forgotten communities like Overtown and Liberty City have become hot commodities in the real-estate market with developers seeing new possibilities for bringing much-longed-for commercial and residential vibrancy to these African-American communities. MIAMI-DADE  The Miami-Dade Chamber of Commerce (MDCOC) has announced the selection of their new President and Chief Executive Officer. Gordon Eric Knowles, tadalafil a seasoned senior executive with extensive experience creating strategic alliances in both the public and private sectors, takes the leadership position.